Alphascape is now unlocked and farmable! Reduced Pricing now available! 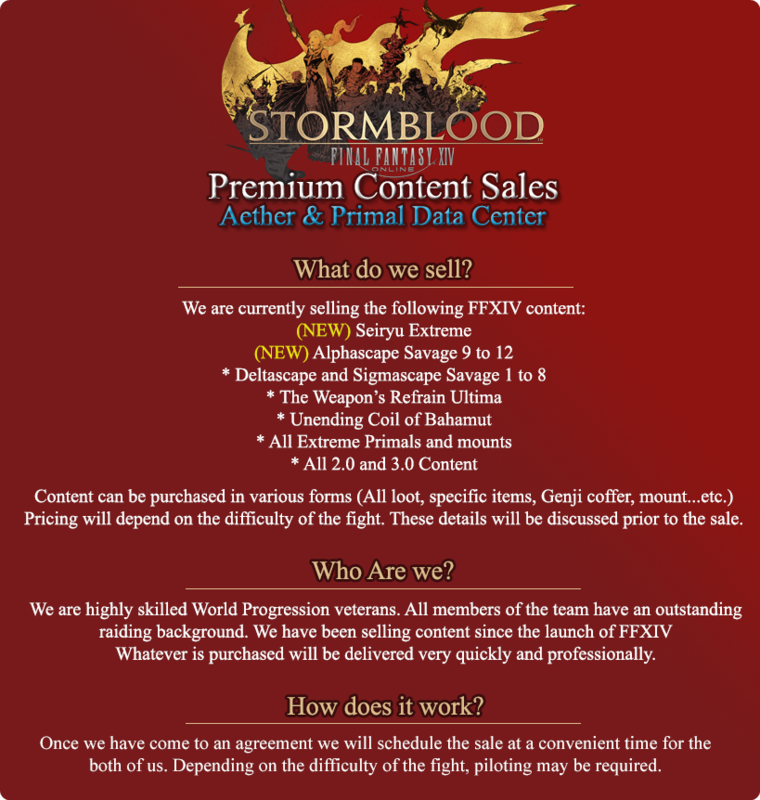 All Aether | Primal Data Center Servers! We offer price matching! Guaranteed to be equal to or cheaper than the rest for top quality and secure sales! Newer content may require us to pilot your character due to strict mechanics. Your account will be played by a trusted member of our team and can be streamed privately to you for no additional cost! Any use of your account will be done by hand, played by our own raid member located in the US/Canada. We have a perfect track record, and have never failed to complete a sale or had a customer suffer any consequences from choosing our services. For whatever reason, if we can not complete the content you purchased, we will refund your payment in full. We accept payment by Paypal, Venmo, Zelle or Bank Transfers! Thanks for choosing us! Bump - Still 1 opening for this week coming up! Double-Booked for the week. Still offering page clears for this week or non-healer loot for 9-12. Next openings are for November 15th and on. still taking reservations for this week! Good man. Beautiful inside and out. +1 Best service in the world. Best night of my life. Would recommend, sent payment and was able to watch my order be completed via live stream! Definitely would reorder. I've been using this service every single week for the last 3 months. Prettylush is 100% competent and knows exactly what he's doing. There is no service that he cannot perform. Sometimes I wake up in the morning and ask myself...did that really just happen? Most memorable nights of my life. Thank you. I have sent you a friend request on discord and have also sent a msg on here as well. Please get back to me, thank you. Have sent message in discord. Prettylush is awesome & trustworthy, I bought runs from a9s to a12s, provided private stream of the smooth runs too. I would recommend his services! Looking forward to doing future transactions with him! Farming sales are open!! Reduced pricing. HMU for info. Just curious how much are a11s and a12s runs each time ? Still offering farming sales to catch up on loot!